TOEIC short for Test of English for International Communication is an international level English proficiency test developed by the Educational Testing Service (ETS), an American based organization for testing the regular English application skills and aptness of the test takers to survive in the international environment. Similar to TOEFL exam, the TOIEC is of professional importance, unlike TOEFL which is of importance for educational purposes. From April 2018 format for Listening and Reading section has changed. Please see differences in listening / reading sections. Total Number of questions / duration and difficulty of new pattern will still remain the same. TOEIC test paper consists of two parts viz. Listening and Reading test and Speaking and Writing test. Listening and Reading Test: This test comprises of 100 MCQs each for the listening section and reading section. The total score for each section is 495, making the total test score count of 990. This is the core part of the TOEIC test, and the test certificate is awarded by your score in the test. Orange is given for scores between 10 and 215. Brown is given for scores between 220 and 465. Green is given for scores between 470 and 725. Blue is given for scores between 730 and 850. Gold is given for scores between 855 and 990. Speaking and Writing test: Introduced in the year 2006 by the ETS (introduced changes in April 2018), it is an optional test which in itself comprises of an option to give both speaking and writing tests or just giving the speaking test and skipping the writing test. Scores for both the tests are given separately. The speaking test analyzes your pronunciation, grammar, vocabulary, and fluency while the writing test analyzes your vocabulary, grammar, overall coherence and organization skills. Both the tests have a maximum score of 200 points in which the test takers are divided into eight proficiency level groups. The speaking test is a short one which takes approximately 20 minutes to complete while the writing test requires 60 minutes for completion. Other than the above tests, private institutions and industries can purchase the rights for conducting internal tests. These tests are known as Institutional TOIEC tests, and they can be conducted by the purchasers according to their will to test their employees. ETS also provides an option to take a TOEIC Bridge test, which is introduced for the beginners and intermediate level candidates comprising of just simple level 100 MCQs. 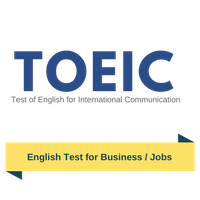 TOEIC is a critical test if you are planning to take up job in any part of the world. Many companies have made it mandatory for its employees to clear the TOEIC with stipulated scores. Moreover, a TOEIC certificate adds up an international standard and upgraded level to one's resume while applying for a job. ETS demands no minimum educational requirements for eligibility of any candidate for the TOEIC. Also, there is no age limit for taking the test. It does not matter if you have already given the test earlier and want to improve your score or you are giving it for the first time. You have the freedom to give the test as many times as you wish for improving your score until you have the money to pay for the test. The procedure for application is easy and simple, which is as follows: Visit the ETS official website, choose a date and place of your choice from the provided list. Register at least 7 days before the preferred test date and make the payment during the time of registration. Carry 2 ID proofs along with the admission ticket while entering the examination hall. Along with these, only two pencils and an eraser are allowed inside the examination hall. The examination fee for TOEIC varies from according to the country, in the US it is around $85 for 2018, which is to be paid during the time of your registration. However, if the test is provided by your organization or company, the final price is set by them. In a case of any cancellations or change of preferred dates, you need to contact your regional ETS office. No refunds will be given upon cancellation. The candidates need not do any special preparations for this test other than improving their English language. Sample question papers for reviewing the test and practice are available on the official website of ETS which is www.ets.org.